With the 50th anniversary of the JFK assassination this November, the past year or so has seen an uptick in fictional accounts involving the events surrounding that day in Dallas, from Stephen King's remarkable time-warp novel "11/22/63" to Stephen Hunter's gripping thriller 'The Third Bullet." In spring, J.A. (Jerry) Ballarotto added his debut novel to the mix. web of conspiracy and intrigue surrounding the JFK assassination, Cuba, a NewJersey crime syndicate, and those extraordinary events of 1963.True to crime-thriller form, there's an anti-heroic twenty-something hero you can root for, an alluring dame, foreign secret agents, FBI suits, counterfeiters, assorted bad guys, lots of action, and pithy lines like: "Some say it was a sign of the times-maybe it was just no sign at all." 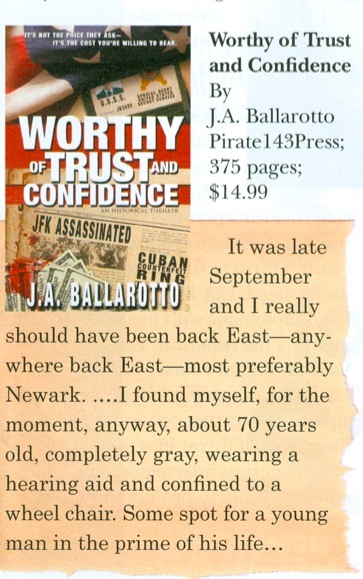 Ballarotto tells a good story (that includes not the usual warmed-over JFK conspiracies but his own theories) that borrows from his real-life experience with the Secret Service. From the novel's first page forward, Ballarotto tells it with a hardboiled, tough, street-smart narrative that recalls Raymond Chandler and Ross MacDonald.